Super Eagles stand-in captain and Al Nassr of Saudi Arabia striker, Ahmed Musa was on Monday night crowned Nigeria’s Footballer of the Year at the 2018 Nigerian Sports Awards. 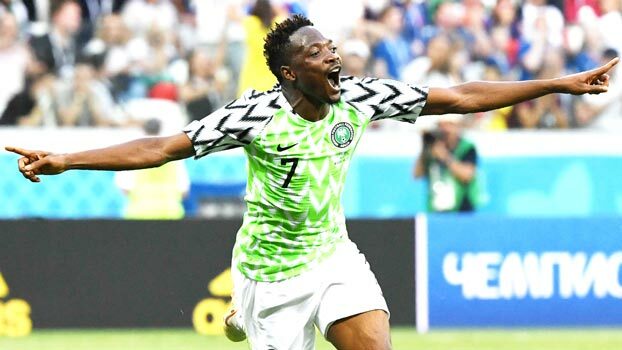 Musa, whose goal against Iceland at the 2018 FIFA World Cup was nominated for the Best Goal of the tournament beat fellow Super Eagles and of Getafe of Spain defender, Kenneth Omeruo and Super Falcons’ Rasheedat Ajibade to the award. He was also the first Nigerian to score more than once in a FIFA World Cup match after scoring twice against Argentina in the 2014 FIFA World Cup. In other categories, Seun Adigun of the Bobsled won the Team Sports Person of the Year, Tobiloba Amusan was adjudged Track and Field Star of the Year while Sports Administrator of the Year went to Francis Orbih, the President of the Nigeria Badminton Federation. Olatunji Yemisi picked the Racket Sportsperson of the Year, Evelyn Akhator was named Basketball Player of the Year and the Special Sports Person of the Year went to Esther Oyema. Joy Udoh-Gabriel won the Discovery of the Year, Odunayo Adekuruoroye retained the Wrestler of the Year, Sportsman of the Year award went to Tennis star, Aruna Quadri while River State Governor, Nyesom Wike was honoured with the Governor of the Year award.